If you are thinking sophistication, classy and chic; then think of the Ashford Castle in Ashford Castle Estate, Cong, Ireland. The history of Ashford Castle starts way, way back in 1228. It was established by Anglo-Norman de Burgo family. It would change ownership severally over the centuries until it was taken over by a Galway developer who converted it into a major tourist destination. If you are thinking sophistication, classy and chic; then think of the Ashford Castle in Ashford Castle Estate, Cong, Ireland. Your accommodations will be characterized by lavish ancient furniture, decor and architectural style. All the 83 rooms found in the castle gives you a 5-star abode from which to enjoy your holiday. Obviously, they are divided into several categories including; Corrib Rooms, Deluxe Rooms, Victorian Deluxe Rooms, Victorian Lakeview Deluxe, Victorian Corrib Lakeview Room, Staterooms and Suites. Among the amenities you will find in the rooms include; direct dial telephone, ironing center, hairdryers, music on demand, movies on demand, interactive TV, internet and safety deposit box. Get ready to be introduced to fine dining. Remember, this was an aristocrat abode and thus there were mannerisms and rituals that were to be observed on the dining table (some of them will make you laugh). There are four places from where you can have your meals. They include; George V Dining Room, Cullen's at the Cottage, the Drawing Room and Cocktail Bar. Among the dishes you can expect to sample include; Traditional Deep Fried Fish, Supreme of Irish Chicken, Irish Stew, Sautéed Diced Beef Fillet, Homemade Tagliatelli Pasta and many more. Expect to sample some of the best wines in the market including; Sauvignon Blanc, Chardonnay, Pinot Grigio, Pinot Noir, Merlot and many more. 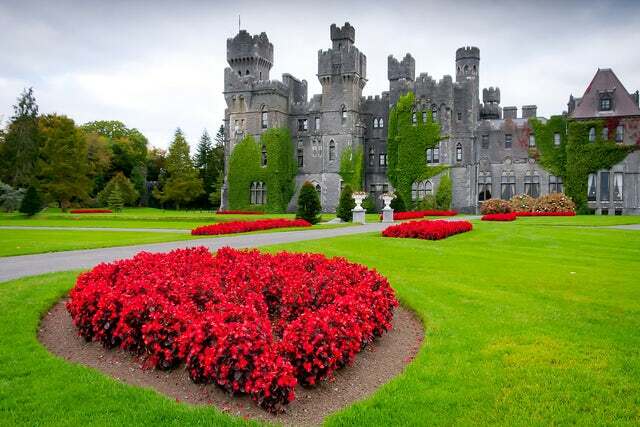 The Ashford castle is a popular venue for weddings and conferences. Its beautiful gardens are the perfect backdrop for a memorable wedding. There is an event planning team at the hotel that will make planning a big event look easy. Popular recreational activities at the castle include; golfing, falconry, lake cruising, bike tours, water skiing, kayaking, archery, clay shooting, equestrian, fishing and many more. Does the castle sound like a place you could spend a fun vacation with the family? Make a reservation today and treat your kids to an adventure filled summer. You can also click here to see what others are saying about the hotel on Trip Advisor.